American schools found themselves immersed in politics this year. A wave of anti-gun violence demonstrations swept the nation following the shooting at Marjory Stoneman Douglas High School, controversial federal policies aroused fear and concern for undocumented students, and teacher rallies and strikes flared up across the country. This occurred amid broader unrest and polarization, with many Americans expressing concern about the state of our politics and the cohesiveness of our society. In this environment, are U.S. schools equipping students with the tools to become engaged, informed, and empathetic citizens? Are they equipping some students—or groups of students—better than others? The 2018 Brown Center Report on American Education endeavors to answer these questions, and others, with three separate analyses of issues related to civics education. Chapter 1 analyzes trends in students’ civics scores (as well as math and reading) on the National Assessment of Education Progress (NAEP); Chapter 2 examines state policy related to civics education; and Chapter 3 provides a look at the nation’s social studies teachers. Read on for highlights of the report. The first chapter explores trends in student performance on NAEP assessments from the late 1990s through the most recent year in which results are available: 2014 in civics, 2017 for math and reading. Math scores climbed sharply in No Child Left Behind’s (NCLB’s) early years, but scores have largely plateaued since then. Scores follow this pattern in fourth-grade reading, but eighth-grade reading scores show slight gains recently after remaining flat initially. 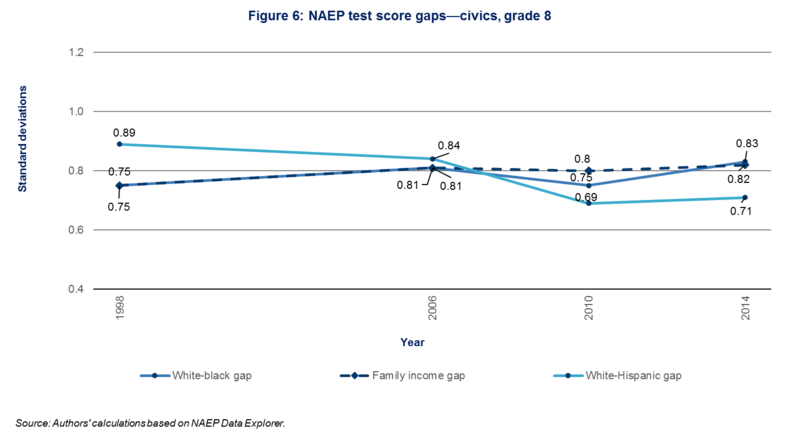 Despite social studies not featuring prominently in NCLB testing requirements, scores on NAEP civics assessments have remained steady or climbed slightly. However, analysis shows that there are wide and persistent gaps by race, ethnicity, and income in civics. As of 2014, the white-black gap was 0.83 standard deviations (SD), the income gap (based on free and reduced-price lunch eligibility) was 0.82 SD, and the white-Hispanic gap was 0.71 SD. These gaps equate to multiple years of academic learning. “The size of these gaps is disconcerting,” the authors write. “Civic participation affords political power, and broad participation is essential for a healthy, inclusive democracy.” Recent U.S. education policy has focused narrowly on student performance in core academic subjects, specifically math and reading. However, the Every Student Succeeds Act, which replaced NCLB in 2015, has the potential to change that, granting greater flexibility to states in designing their accountability systems. Read Chapter 1 in full here. In the second chapter, the authors analyze the extent to which states have incorporated recommended practices into requirements for civics education, compiling an inventory that spans all 50 states and Washington, D.C. After review, 42 states plus Washington, D.C., require at least one course related to civics education as a high school graduation requirement; most states require two or three. However, only about half have incorporated participatory elements of learning or community engagement, such as mock trials, into their standards. 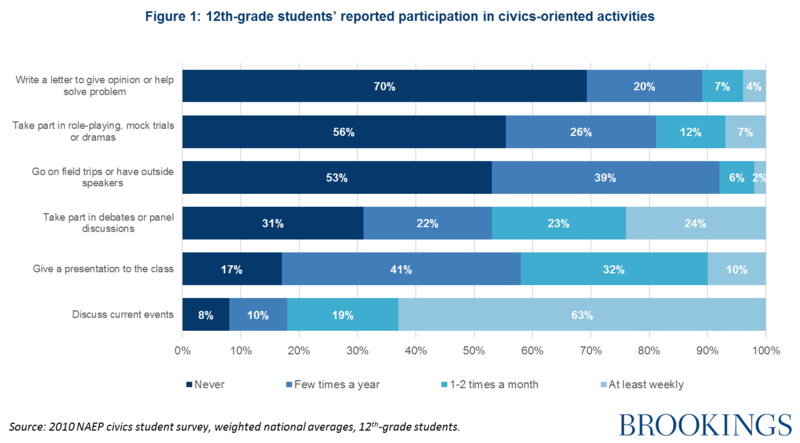 While discussion and knowledge-building components of civics education appear frequently across states, participatory elements and community engagement appear less common. Read Chapter 2 in full here. The final chapter of the 2018 Brown Center Report focuses on the state of America’s social studies teachers. 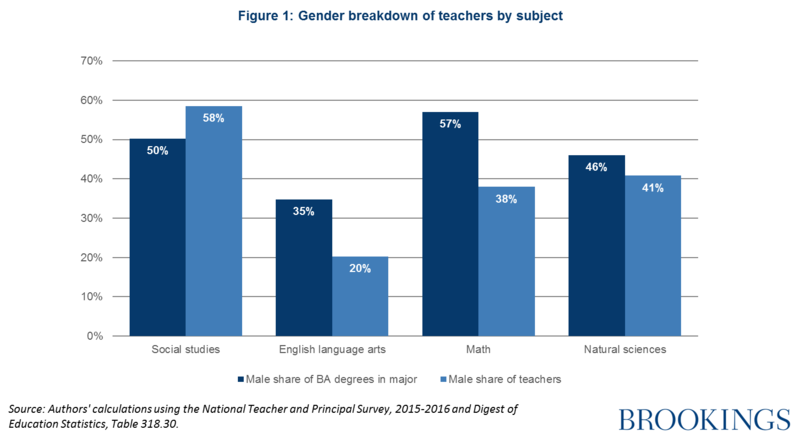 By presenting statistics on the demographics, qualifications, responsibilities, compensation, and satisfaction of high-school social studies teachers, the authors reveal how these educators differ from other subject-specialized teachers. Read Chapter 3 in full here. These chapters provide a portrait of how complex and varied civics education is in the United States, using student performance, state policies, teacher characteristics, and survey results as windows into students’ experiences. Overall, the 2018 Brown Center Report argues that education policy and practice in the United States should place greater emphasis on schools’ role in supporting and strengthening American democracy.